Haq's Musings: Pakistan's Debt Crisis: Fact or Fiction? Pakistan is taking on significant amounts of domestic and foreign debt to finance its budget deficits and to support major energy and infrastructure development projects as part of China-Pakistan Economic Corridor (CPEC). Over one-third of this public debt is external debt denominated in US dollars, Euros and other hard currencies. At the same time, Pakistan's exports have declined over the last several years and the country's current account deficits have grown. 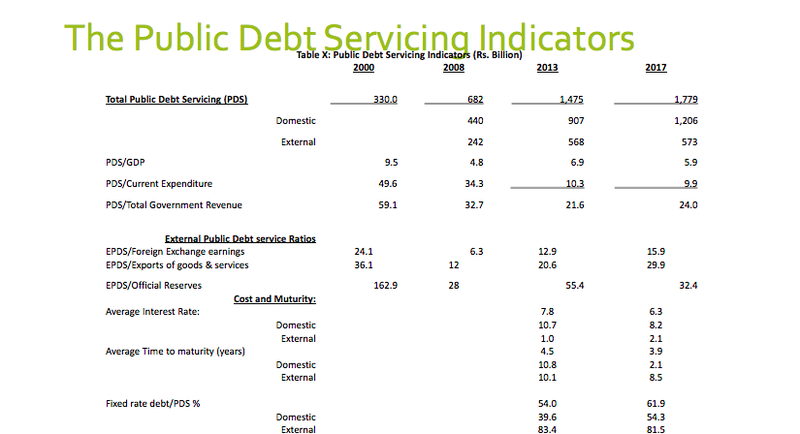 Pakistan’s total debt and liabilities (TDL) consist of public debt and private debt. Total stock of outstanding debt and liabilities on June 30, 2017 stood at 79% of gross domestic product (GDP). 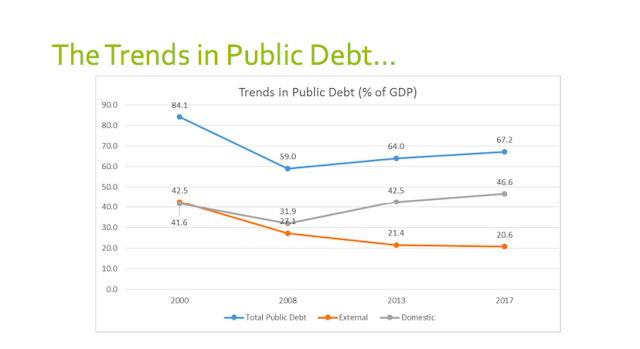 Of this, Gross Public Debt accounted for 85% of the total outstanding or 67.2% of GDP. The remaining 15% is the private debt mostly to borrowers outside the country, for which the government has no fiscal obligation, but the SBP has to provide foreign exchange to service this debt. Within the gross public debt, the government’s share was predominant – almost 92% while the balance was owed by the public enterprises but guaranteed by the government. Borrowing from IMF is also included in gross public debt, although it is a liability of the SBP. As of June, 2017, Pakistan's total public debt-to-gdp ratio is 67.2%, up from 59% in 2008 and 64% in 2013, according to an analysis by Dr. Ishrat Husain, former governor of the State Bank of Pakistan. The external debt-to-gdp ratio is 20.7%, down from 28.8% in 2008 and 21.3% in 2013. Pakistan's external debt to foreign exchange earnings ratio has shot up to 161.9% from 123.9% in 2008 and 121.3% in 2013. Public External Debt is lower in 2017 i.e. 20.7% of GDP while it was 27.1% in 2008 and 21.4% in 2013. About 93 pct of the public external debt falls under the category of Medium and Long term while 7% under the short term. Therefore the risk appetite for further short term borrowing to tide over payment difficulties cannot be ruled out as the short term public external debt to SBP reserves ratio is 5.5%. Concessional loans still form more than half of the outstanding stock and commercial loans account for only 1.6 percent of the total. 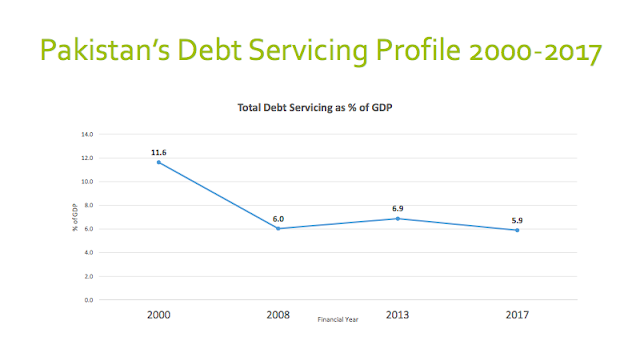 Pakistan's current debt servicing requires 5.9% of GDP. It is down from 6% in 2008 and 6.9% in 2013. These percentages are by no means alarming. However, the external debt service component to be repaid in US dollars is of concern because of declining foreign currency earnings. A major setback has been caused by stagnation in foreign exchange earnings due to a $ 4 billion drop in export receipts since 2013 .This has raised the EDL (external debt and liabilities) to FEE (foreign exchange earnings) ratio from 121 to 162 in 2017 . There has been some growth in exports in last few months but the pace is unspectacular to make a dent. The other element which is picking up is Foreign Direct Investment but that also won’t be able to lower this ratio significantly. On the fiscal side, almost 24% of government revenues were pre-empted by payments of interest and foreign loan repayments . The average interest rate is down to 6.3 percent with domestic debt being relatively expensive at 8.2 percent. As of June, 2017, Pakistan's total debt-to-gdp ratio is 67.2%, up from 59% in 2008 and 64% in 2013, according to an analysis by Dr. Ishrat Husain, former governor of the State Bank of Pakistan. The external debt-to-gdp ratio is 20.7%, down from 28.8% in 2008 and 21.3% in 2013. 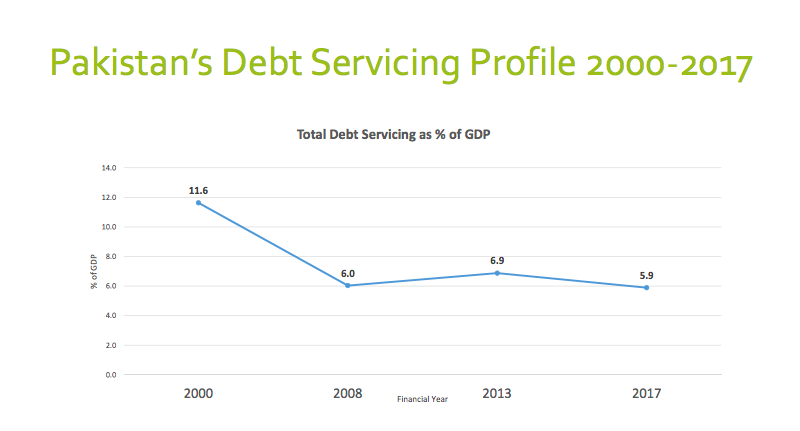 Pakistan's current debt servicing requires 5.9% of GDP. It is down from 6% in 2008 and 6.9% in 2013. These percentages are by no means alarming. However, the external debt service component to be repaid in US dollars is of concern because of declining foreign currency earnings. Pakistan's external debt to foreign exchange earnings ratio has shot up to 161.9% from 123.9% in 2008 and 121.3% in 2013. Of these, the critics are absolutely right about the last one---the ratio of external debt to foreign exchange earnings. Pakistan has to heed their warnings and urgently address its declining exports and rising current account deficits to avoid the potential external debt trap. Riaz Sb...Very unique perspective of the problem.. What does domestic debt constitute? Is it the savings we put in the banks that the banking system owes us? Or govt bonds we buy? Is one kind of debt better than others? Debt to GDP is always moving, and fluctuates based on growth in GDP and new debt. The current GDP is about 40 trillion rupees, if that grows 10% this year (real growth plus inflation) and the government takes on new debt that is 6% of GDP, the ratio stays the same at around 60% debt to GDP. If growth is faster and new debt is less, then the ratio will decline and vice versa. The most important element to avoid excessive debt burden is to maintain rapid economic growth. The CPEC investment adds debt, but if it raises growth rates it more than pays for itself. The other element to consider is wether the GDP is an accurate number. The debt is easy to measure, but as you have pointed out before, Pakistan's GDP is undercounted. We are supposed to get a rebasing of GDP in 2018, for the first time in over 10 years (the US essentially rebases every year), and I expect the size of the GDP will be increased by 20% or so. That will result in the debt to GDP declining from 60% of GDP to about 50% of GDP. NA: "The CPEC investment adds debt, but if it raises growth rates it more than pays for itself." Repaying Pakistan's external debt requires that Pakistan bring in enough US $ and other currencies through exports, remittances, foreign investments etc. A recent BMI report published by the World Economic Forum recently at Davos says that "Pakistan will develop as a manufacturing hub over the coming years, with the textile and automotive sectors posting the fastest growth at the beginning of our forecast period. Domestic manufacturing investment will be boosted by the windfall from lower energy prices compared to the last decade, and improved domestic energy supply." If CPEC makes it happen, then I think Pakistan will be in good shape with respect to exports and its current accounts. Exports have been weak for several years, the primary reason is an overvalued rupee. Rupee was at 60 to the dollar in 2007. Since then Pakistan inflation has run a cumulative 120%, while US inflation has been 20%. As such the exchange rate should have slid to 120 to 130 to the dollar, but has been kept substantially overvalued at 100 to the dollar (the government recently let it slip to 105). An overvalued rupee hurts exporters while keeping imports relatively cheap. This pleases urban consumers who buy imported goods, while a major devaluation would be politically damaging in front of an election. I expect, and hope, that after elections this year the new government lets the exchange rate get back into balance. Actually, the Asian Tigers developed on the backs of deliberately undervalued currencies, which gave exporters a boost and depressed imports without having to resort to erecting tariff barriers. Pakistan should pursue the same strategy. A devaluation would in the short run increase the burden of dollar denominated foreign debt, but Pakistan's foreign debt burden is still modest. NA: "Actually, the Asian Tigers developed on the backs of deliberately undervalued currencies, which gave exporters a boost and depressed imports without having to resort to erecting tariff barriers." Yes, Asian Tigers did keep their currencies undervalued. But they also made themselves much more competitive by building energy and infrastructure to support manufacturing. And they diversified their exports by bringing in US tech companies for higher value products. Hope CPEC helps Pakistan do that in special economic zones like the one that just opened in Gwadar. The past few months have seen a decent uptick in Pakistan’s merchandise exports. The first five months of 2017-18 have seen exports grow by 10.5 per cent over the same period during previous fiscal year. The November 2017 monthly export data indicates a growth of 12.3 per cent in comparison to November 2016. Similarly, during the first four months of the ongoing fiscal year, large-scale manufacturing has posted a growth of 9.6 per cent. Sectors which have posted positive growth include: iron and steel, automobiles, petroleum, food and beverages, electronics, non-metallic products, pharmaceuticals and textile. While several of the above-mentioned sectors are beneficiaries of the ongoing investments under China Pakistan Economic Corridor (CPEC) programme, it is noteworthy that some key sectors with export potential have seen falling production in the current fiscal year, including leather, engineering products, and chemical sectors. One hopes that in 2018 the government will be better prepared with feasibilities of all nine Special Economic Zones (SEZs). As of now we understand that even in the existing industrial estates across Pakistan it is a challenge to get new electricity and gas connections. A debate is raging that the economy is in dire straits and the continuation of present policies is a recipe for complete disaster. Any economy has two sides, the real and the monetary-financial. The disaster story relates to the latter. The classical economists used to think that money is merely a veil and what matters is the real economy of goods and services. In Pakistan, the cohabitation of political transitions and economic crisis is a familiar sight. The story line begins with the external sector and the government sector in terms of financial and monetary indicators. For the February 2008 elections, the transition fiscal year was 2007-08. Total debt was 63.2% of GDP and the external debt and liabilities were 30.7% of GDP. The SBP’s liquid reserves were 8.8 billion dollars, covering imports of 17 weeks. Short-term external debt was 8.2% of reserves. Inflation, current account deficit and fiscal deficit at 12%, 8.5% and 7.6% had all crossed danger zones. GDP growth of around five per cent was the lowest in five years. The economy was clearly on the downhill, touching the bottom at 0.36 in 2008-09. The transition fiscal year for elections in May 2013 was 2012-13. Total debt was 69.5% of GDP and the external debt and liabilities were 26.3% of GDP. The SBP’s liquid reserves were 6.1 billion dollars, covering 14.3 weeks’ imports. Short-term external debt was 4.4 % of reserves. The rate of inflation, current account deficit and the fiscal deficit were 7.4%, 1.1 % and 8.2%, respectively. GDP growth was low at 3.7%, but the economy was on the upturn. For the 2018 elections, 2017-18 is the transition fiscal year. The source of information for the year is the latest press release of the IMF, an organisation concerned mainly with the monetary and financial side of the economy. It expects fiscal deficit at 5.5 per cent, current account deficit at 4.8 per cent and GDP growth at 5.8 per cent. As a result, ‘risks to Pakistan’s medium-term capacity to repay the fund have increased’. Remember Ishaq Dar’s refrain that he had to go to the IMF to repay the debt contracted by the previous government. Free of political compulsions, the caretaker government had prepared the ground for it. The deal was to pay back without reform. The signs of slowly increasing growth were ignored. Are we heading for a repeat of the script? The deputy head of the IMF has already made it clear that the possible grey-listing by the FATF does not disqualify a member to access its lending. The upturn in the real economy continues. CPEC investment will boost it further. The country has the ability to grow out of the present financial strife. Reform must be undertaken, but without repeating the mistake of the anti-growth IMF support. Clarifying a news item titled “Pakistan’s net reserves stand a minus $724 million” published in a section of press, the spokesman said the story was based on the recently published Post Programme Monitoring (PPM) report by the International Monetary Fund (IMF). He said,” The Net International Reserves (NIR) position reflects foreign currency assets of the Central Bank as against its liabilities.” The story was comparing spot position of foreign exchange reserves with long term liabilities of the State Bank, which was not a good comparison as liabilities were to be retired gradually over a period of five to ten years time and not immediately in one instalment, he added. He said the IMF loan for instance was to be repaid by the year 2026 meaning approximately $800 million repayment a year starting from 2018. It was also pertinent to mention that when present government took charge in 2013, Pakistan’s NIR was negative $ 2.5 billion, he added. He said the decrease in foreign exchange reserves were mainly due to current account deficit of which imports were the main component. Imports had shown unprecedented increase during 2016-17, while exports were declined. The spokesman further said the negative trend in exports had bottomed out and the government initiatives had shown positive result as exports had increased by about 12 percent workers’ remittances improved by 3.4 percent during July-February, 2017-18 and the Foreign Direct Investment (FDI) also posted strong growth of 15.6 percent during July-Feb, FY2018 over last year. He said while the current account deficit which had seen expansion above 210 percent in July of current fiscal year had now been started contracted as during Jul-Jan FY2018 it had been contained at 48 percent. With these positive trends strengthening, incoming months the current account deficit will improve in FY18, the spokesman said. He added that the writers, in fact, had ignored the positive side of Fund’s assessment and had focused only on interpreting the potential challenges to the economy highlighted by the Fund. He said the IMF had also endorsed the positive and favourable outlook for economic growth, with real GDP estimated to grow at 5.6 percent in 2017/18 within favourable inflation environment. The Fund had mentioned that the economic growth had continued to strengthen supported by improved energy supply, investment related to the China-Pakistan Economic Corridor, strong credit growth, and continued investor and consumer confidence. The spokesman said it was important to share some positive trend of the economy during the current fiscal year. The government had been able to achieve fiscal consolidation without compromising development expenditures as fiscal deficit had been contained at 2.2 percent of GDP during first half of current fiscal year against 2.5 percent in the same period of FY2017. He said PSDP expenditures increased to Rs.733 billion during FY2017 over last year and this year the allocation was Rs.1 trillion. FBR tax collection continued to show impressive growth above 17 percent during July- February, FY2018 while inflation had been contained at 3.84 percent during July-Feb, FY2018 against 3.90 percent in the same period of FY2017. LSM had shown impressive broad-based growth of 6.33 percent during July-Jan,FY2018 compared to 3.59 percent of last year. FDI after witnessing a subdued growth during last two months of CFY2018 had improved in February 2018 by 235 percent over January 2018, and by 15.6 percent during July-Feb, FY2018, he added. Adviser to the Prime Minister on Finance Miftah Ismail, Thursday, said that Pakistan’s net debt has increased from 60.2 per cent to 61.4 per cent while liquid forex reserves have declined by $4.5 billion. Miftah Ismail said net debt has increased from 60.2 per cent to 61.4 per cent, while the external debt has decreased from 21.4 per cent of Gross Domestic Product (GDP) to 20.5 per cent of the GDP during FY17-18. He said the government has had to take on external debt to finish projects that the previous governments had taken on and not completed. On Thursday, the adviser to the Prime Minister on Finance along with the Minister for Planning and Development Ahsan Iqbal revealed the economy’s performance over the fiscal year 2017-18 (FY17-18), a day before the announcement of federal budget FY 2018-19. According to the Pakistan Economic Survey (PES), the total public debt stood at Rs22.82 trillion by the end of December 2017 and it recorded an increase of Rs1.4 trillion during the first six months of the current fiscal year. “With the current account deficit widening and not being fully offset by financial inflows, the country’s total liquid forex reserves fell by $4.5 billion during July-March FY17-18,” the PES said. “Pakistan’s current account deficit contracted by 9.2 per cent on a month-on-month basis in March 2018 and reached $1.16 billion compared to $1.28 billion in February 2018. However, the current account deficit widened by 50.5 per cent and reached $12.03 billion (3.8 per cent of GDP) during July-March FY17-18,” according to the PES. The PES also said that this was mainly due to 20.7 per cent widening in the trade deficit, amounting to $22.3 billion. The widening of trade deficit is mainly due to a surge in the import bill by 16.6 per cent, reaching $40.6 billion. About fiscal position, PES said that total revenues grew by 19.8 per cent to reach Rs2.38 trillion (6.9 per cent of the GDP) during July-December, FY17-18 against Rs1.99 trillion (6.2 per cent of the GDP) in the same period last fiscal year. “The impressive performance both in tax and non-tax revenues is attributed to a significant rise in total revenues. During the first nine months of the current fiscal year, the Federal Bureau of Revenue has been able to collect around Rs2.63 trillion against Rs2.27 trillion during the same period of FY16-17, posting growth of 15.8 per cent,” according to the survey. “Total expenditure increased by 14 per cent during July-December, FY17-18 and stood at Rs3.18 trillion (9.2 per cent of GDP) against Rs2.79 trillion (8.7 per cent of GDP) in the same period of FY16-17. Within total expenditure, development spending (excluding net lending) increased sharply and were recorded at 23.4 per cent to reach Rs613.8 billion during July-December FY17-18 as compared to Rs497.4 billion in the comparable period of FY16-17,” the PES said. The fiscal deficit in the first six months of FY17-18 was restricted to 2.3 per cent of the GDP compared to 2.5 per cent during the corresponding period last year due to strong growth in revenues relative to expenditures, according to the PES 17-18. Speaking on the occasion, Minister for Planning and Development Ahsan Iqbal said the current fiscal year has seen continued exports growth in all nine months as the exports increased by 12 per cent while imports have slowed down to 16.6 per cent as compared to 48 per cent at the start of the current financial year. The PES said that exports from July-March in FY17-18 had reached $17.1 billion, compared to $15.1 billion in the corresponding period last year, registering 13.1 per cent growth. Imports grew 15.7 per cent during the same period, rising from $38.37 billion in FY16-17 to $44.38 billion this year, registering an increase of $6.01 billion in absolute terms, the PES said. “Every statistic has improved and we have managed to increase gross domestic product growth rate and at the same time contained the budget deficit and inflation,” said Ismail. Pakistan’s economy expanded to $313 billion, the highest in history. Ismail admitted problems on the external front and expressed the hope that the recent two devaluations of the rupee against the US dollar would help narrow down the widening current account deficit. He said that the government did not want to curtail imports but was trying to bridge this gap by increasing exports and remittances. The investment-to-GDP ratio stood at 16.4% against the five-year target of 22.8%. This ratio was slightly better than last year’s revised rate of 16.1%. Savings slipped below last year’s level of 12% and stood at 11.4% of GDP, far below the five-year target of 21.3% of GDP. Fixed investment remained at 14.8%. Public investment increased to 5% of GDP, which was better than the previous year. The target of private investment was also missed by a wide margin, which stood at 9.8% of GDP against the five-year target of 16.7%. Results for private investment are worse than last year when they had been estimated at 10%. The PML-N government claimed to achieve an economic growth rate of 5.8% in its last year in power that is the highest over the past 13 years. But it is significantly lower than the 7% target the incumbent government wanted to achieve when it came to power in 2013. However, the current growth rate is decent enough to give a political advantage to the ruling party in the upcoming general elections. In 2012-13, which was the last year of the PPP tenure, the economic growth rate was 3.7%. Just under than two-thirds of growth — 66.4% to be precise — came from the services sector, which performed slightly better than the expectations. The government achieved growth targets for services and agriculture sectors but missed the industrial sector growth target again. Despite a better economic performance, the growth rate was still insufficient to absorb the youth bulge — Any pace of growth below 7% rate would increase unemployment. Pakistan’s external debt and liabilities have soared to a record $91.8 billion, showing an increase of over 50% or nearly $31 billion in the past four years and nine months, the State Bank of Pakistan (SBP) has reported. The external debt and liabilities of $91.8 billion as of March-end suggest that the figure may touch $100 billion very soon as the country faces grave challenges in meeting growing external financing requirements. Pakistan is scheduled to make some bullet debt and interest payments in the last quarter (April-June) of the current fiscal year, according to sources in the finance ministry. The $91.8-billion external debt and liabilities were higher by $30.9 billion or 50.6% compared to the level recorded in June 2013 when the Pakistan Muslim League-Nawaz (PML-N) government came to power. Of the total external debt and liabilities, the government’s public debt obligations including foreign exchange liabilities were $76.1 billion at the end of March. In the past four years and nine months, the public debt-related obligations increased 42.5% or $22.7 billion, showed the central bank data. 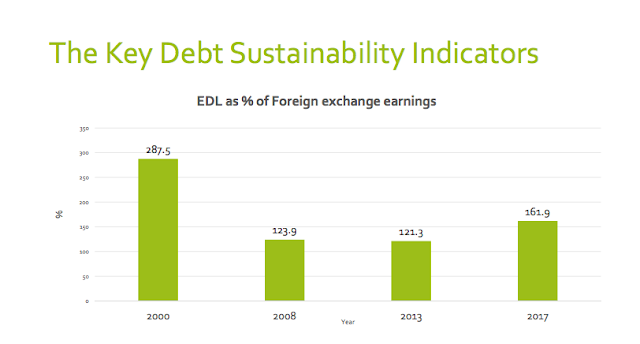 In June 2013, the external public debt including foreign exchange liabilities stood at only $53.4 billion. A major hike came in the external debt contracted by issuing sovereign bonds and taking expensive commercial loans. Since June 2013, the PML-N government has acquired a whopping $42.6 billion in external loans, which is taking its toll on the national exchequer due to the mounting debt servicing cost. Starting from July 2013, with every passing year, the quantum of external debt has kept growing due to the government’s inability to implement policies that could have ensured sufficient non-debt creating inflows. The International Monetary Fund (IMF)’s first post-programme monitoring report shows Pakistan’s gross external debt in terms of exports was 193.2% in 2013, which is projected to deteriorate to an alarming 316% in June this year. During this period, Pakistan’s gross external financing requirements have swelled from $17.2 billion to $24 billion. Pakistan expects to obtain $1 billion to $2 billion of fresh Chinese loans to help it avoid a balance-of-payments crisis, Reuters reported. Some observers hope China's economic assistance will help the country avoid having to go to the IMF for a bailout, but the key issue is the sustainability of China's financial help. China will not be stingy in offering help to Pakistan to strengthen its infrastructure, but China's bank loan is a market-driven commercial decision in line with international practices. The main point is Pakistan's debt repayment ability. China-based financial organizations stick to a principle of not imposing additional political conditions when providing loans to other countries, distinguishing them from most Western financial institutions like the IMF. This might be one reason why Chinese loans are welcomed in Pakistan. China is likely to continue to finance new projects in the country but will also assess their debt repayment ability to avert the risk of bad debt. After all, Chinese loans to Pakistan are not a gift. The multi-billion dollar China-Pakistan Economic Corridor (CPEC) has begun to bring tangible benefits to Pakistan's economy, which is likely to boost Pakistan's debt repayment ability. It's possible that we're entering a virtuous cycle in which Chinese loans promote the development of the CPEC, and this then improves Pakistan's debt repayment ability. However, the South Asian country may need to propel economic reforms to ensure the effectiveness of the loans and allow the local economy to benefit more from CPEC projects. It is hoped that people will learn a lesson from the IMF's operations. In 2013, the IMF approved a loan plan for Pakistan to support its program to stabilize and rebuild the economy, but the multilateral lender failed to strictly monitor the use of the loans, and in the end they did little for Pakistan's economic development. Now Pakistan's economy is on an upswing with the help of Chinese loans. Nadeem Javaid, who advises Prime Minister Nawaz Sharif's government and works closely on the CPEC program, was quoted by Reuters as saying last year that debt repayments and profit repatriation from CPEC projects will reach $1.5 billion to $1.9 billion in 2019, rising to $3 billion to $3.5 billion by the following year. China is likely to strengthen economic collaboration with Pakistan under the CPEC program, in a bid to ensure the effectiveness of the loans. The key to stronger cooperation between the two countries lies in how to improve Pakistan's economic innovation capability and allow the country to develop its own capacity for long-term economic sustainability. China's loans to Pakistan essentially aim to drive Pakistan's economic development, and thus the loans should be offered in a way that aligns with the local economy and helps restructure the South Asian economy and boost its manufacturing and exports. 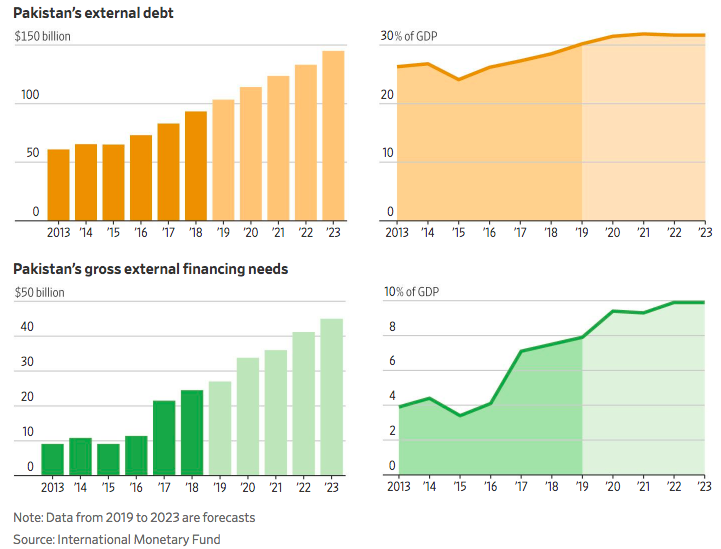 For many in Pakistan it’s a question of when -- rather than if -- the nation will go to the International Monetary Fund for financial support to pay its soaring foreign debt as reserves dwindle. External debt and liabilities has increased 76 percent to 10.6 trillion rupees ($92 billion) since June 2013, taking the ratio up to 31 percent of gross domestic product, the highest in almost six years. 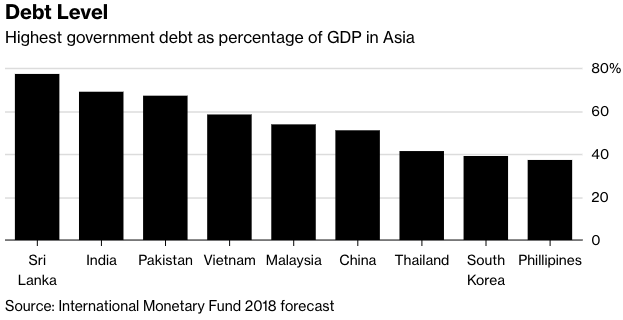 Pakistan’s debt will continue to grow as it has the highest financing need as a percentage of GDP in emerging markets over the next two years, according to IMF projections. It’s not an unusual situation for Pakistan, which has gone through decades of debt blowouts and balance-of-payment imbalances. South Asia’s second-largest economy has received 12 IMF bailouts since the late 1980s and completed its last loan program just two years ago. The nation is once again facing a crunch after foreign-exchange reserves dropped to the lowest in more than three years, forcing authorities to devalue the currency twice in recent months and hike interest rates. To help repay debts and keep the economy going, another IMF loan is possibly the next step. Pakistan’s economic picture was generally rosy up until the past year. The current government, which will hand over to a caretaker administration on Friday ahead of July 25 elections, has managed to boost economic growth to its highest level in a decade. That was aided in part by low oil prices, the completion of a $6.6 billion IMF program in September 2016 and the Chinese financing of about $60 billion in infrastructure across the country as part of Beijing’s flagship Belt and Road initiative. The growth boom has come with rising imports of Chinese machinery and other goods, widening Pakistan’s current-account deficit by 50 percent this year. Added to that is Islamabad’s mounting debt to Beijing and questions over how it will eventually repay billions of dollars over the medium to long term. Surging oil prices are making matters worse. The central bank recently warned that “the balance of payments has further deteriorated” because of rising crude and investor inflows remaining limited. Pakistan has received nearly $10 billion in foreign loans in the past 11 months, and almost three-fourths have been utilised for budgetary support and meeting external financing requirements, underscoring that the amount cannot be returned without resorting to fresh borrowing. The total loan disbursement from July through May of fiscal year 2017-18 stood at $9.98 billion, reported the Economic Affairs Division on Monday. The 11-month disbursements were significantly higher than the budgetary estimate of $7.7 billion. As compared to five years ago, when about two-thirds of the loans used to be taken for project financing, now around 75% are obtained for budgetary support and building foreign currency reserves. This suggests that these loans have not been put into productive sectors of the economy, making it impossible to retire them without taking new loans. From July through May, project financing stood at a mere $2.8 billion or 28% of the total disbursements, according to the EAD – a division working under the Ministry of Finance. Over half of the project financing went into only three projects – Orange Line Metro project, Thakot-Havelian project of the China-Pakistan Economic Corridor (CPEC) and Multan-Sukkur section of the CPEC – showed official statistics. China disbursed $836 million for the Multan-Sukkur project, $296 million for Thakot-Havelian and $334 million for the Orange Line project, Lahore – the flagship scheme of former chief minister Shehbaz Sharif. Overall, the government of China and its financial institutions provided $3.8 billion or 38.5% of the total loans received during the first 11 months of the current fiscal year. This includes $1.64-billion project financing from China and $2.2 billion as commercial loans by Chinese banks. In addition to $3.8 billion direct disbursement of loans, China has also extended a $3-billion credit facility that Pakistan has also almost fully utilised to stabilise its nose-diving foreign currency reserves. In May, Pakistan received another $493 million as foreign commercial loan from a consortium of Credit Suisse AG, taking the European bank’s contribution to $750 million during the current fiscal year. Pakistan received $3.5 billion in foreign commercial loans in 11 months, which is equal to 35% of the total loans received during this period. It also floated $2.5 billion Eurobonds during the current fiscal year. With the fresh borrowing of $10 billion, total foreign loans the last PML-N government obtained during its third stint (July 2013 to May 2018) have now increased to a record $44.8 billion. Most of these loans have been obtained to help boost foreign currency reserves, finance a bulging current account deficit and for budgetary support. Pakistan’s external debt and liabilities have soared to a record $92 billion as of March-end, an increase of over 50% or nearly $31 billion in the past four years and nine months, according to the State Bank of Pakistan (SBP). Out of total external debt and liabilities, the government’s public debt obligations including that of foreign exchange liabilities were $76.1 billion as of end March. The public debt-to-gross domestic product (GDP) ratio peaked to 70.1% – as against 63% at the end of the PPP tenure. This ratio is far higher than the sustainable levels for a country like Pakistan. High debt levels are consuming over 30% of the federal government budget on account of debt servicing cost. The increase is debt is primarily on account of a rise in commercial borrowings and NRI deposits. MUMBAI: India's total external debt for the quarter ended March 2018 rose on a year-on-year basis by over 12 per cent to $529.7 billion, official data showed on Friday. According to the RBI, external debt rose to $529.7 billion from $471.3 billion reported for the corresponding period of 2017, on the back of an increase in commercial borrowings, short-term debt and non-resident Indian (NRI) deposits. "At end-March 2018, India's external debt witnessed an increase of 12.4 per cent over its level at end-March 2017, primarily on account of an increase in commercial borrowings, short-term debt and NRI deposits," the RBI said in a statement on "India's External Debt as at the end of March 2018". "The increase in the magnitude of external debt was partly due to valuation loss resulting from the depreciation of the US dollar against major currencies. The external debt to GDP ratio stood at 20.5 per cent at end-March 2018, higher than its level of 20 per cent at end-March 2017." As per the statement, valuation loss worth $5.2 billion occurred due to depreciation of the US dollar vis-a-vis major currencies like Euro, SDR (special Drawing Right), Japanese Yen and Pound Sterling. "Excluding the valuation effect, the increase in external debt would have been US$ 53.1 billion instead of $58.4 billion at end-March 2018 over end-March 2017," the statement said. "Commercial borrowings continued to be the largest component of external debt with a share of 38.2 per cent, followed by NRI deposits (23.8 per cent) and short-term trade credit (19 per cent)." “Yes, it is with us,” said one finance ministry source, in reference to the Chinese money. The second source added that the “matter stands complete”. With the latest loan, China’s lending to Pakistan in this fiscal year ending in June is set to breach $5 billion. In the first 10 months of the fiscal year China lent Pakistan $1.5 billion in bilateral loans, according to a finance ministry document seen by Reuters. During this period Pakistan also received $2.9 billion in commercial bank loans mostly from Chinese banks, ministry officials told Reuters. But analysts say China’s help will not be enough and predict that after the July 25 national election the new administration will likely seek Pakistan’s second bailout since 2013, when it received a package worth $6.7 billion from the IMF. Consumer loans and SME loans accounted for only 12% of total bank loans (PKR498 billion and PKR422 billion respectively) at the end of 2Q18, while the loan-to-deposit ratio of the banking system is only 53%, down from 75% in 2008 (see following charts). Meanwhile, 69% of bank loans are to the corporate sector. But it is not leveraged, with corporate debt totaling only 16% of GDP. The lack of private sector debt is important since it means the economy can recover quickly from its latest crisis once the current hole in the balance of payments is plugged, as is likely to be the case by a combination of China and IMF funding, combined with some extra support provided by Saudi Arabia. Pakistan secured last month a US$3 billion direct deposit and a US$3 billion deferred oil payment facility from Saudi Arabia. This US$6 billion package amounts to about half of Pakistan’s FY19 estimated net financing gap. The risk here, of course, is that the Trump administration politicizes the latest IMF negotiation as regards Pakistan, as it has threatened to, by making the China-Pakistan Economic Corridor (CPEC) an issue. Pakistan is so far the major beneficiary of China’s so-called One Belt One Road (OBOR) program. But this risk was greater two or three months ago given that Donald Trump now looks like he wants to meet Xi Jinping at the G20 Summit in Buenos Aires at the end of this month. This time the request is for about US$6-8 billion from the IMF to fill the gap this year and next. The IMF team has been in Islamabad, Pakistan’s capital, since Nov. 7. It is also the case that a significant part of a classic macroeconomic adjustment has already taken place with the Pakistani currency, the rupee, having depreciated by 21% against the US dollar since Dec. 2017 to PKR134/US$, while interest rates have been hiked by 275bp to 8.5% (see following chart). The new government, elected in August, has also increased average tariffs for electricity and gas by 11% and 30% respectively. Most observers expect around another 5% depreciation of the currency and perhaps another 150-200bp of rate hikes, though the magnitude will primarily be influenced by external developments such as the trend in the US dollar and the oil price. Like its neighbour India, Pakistan is also dependent on imports for its energy consumption. Exports of goods and services as a percentage of GDP were only 8.2% in 2017, among the lowest in the world. The good news is that import growth is now slowing as the weaker currency impacts. Imports of goods declined by 1%YoY in October in US dollar terms and were up 7.6%YoY in the first ten months of 2018, compared with a 22.3% increase in 2017 (see following chart). The bad news is that Pakistan suffers from a chronic lack of exports which is why it keeps having these balance of payments crises. Indeed exports of goods and services as a percentage of GDP were only 8.2% in 2017, among the lowest in the world (see following chart). Exports of goods have been relatively static since 2011 running at around US23 billion a year (see following chart).